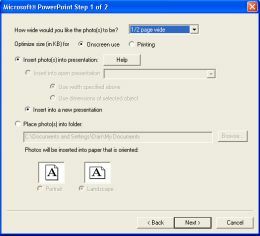 Automatically insert into template document (replaces all occurrences of <photo> with a photo. Great for real-estate agents, appraisers, and other people who need to insert photos into prepared document templates. 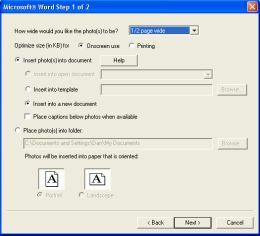 Prepare photos for manual insertion into a document at a later time. Automatically resize photos to fit within boundaries of selected object in presentation. Prepare photos for manual insertion into a presentation at a later time. Download Photolightning photo software and try it today! You won't find easier to use software for preparing photos for Word and PowerPoint anywhere.